Typically Abdel Wahab’s works are higher-level divine figures whose richness and structure suggest a pure and Eternal Presence. Abdel-Wahab is a renowned figure among contemporary Egyptian sculptors. 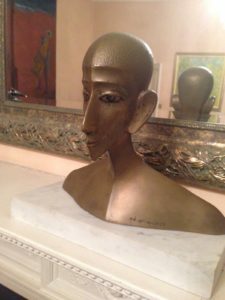 He devoted his art to the exploration of a contemporary interpretation of Egyptian sculpture. His main interest was in the figure of Akhenaton, in whom he imagined worthy and contemplative features that exemplified sincere piety. He created highly ornamented large and small-scale sculptures, as well as a relief sculpture. 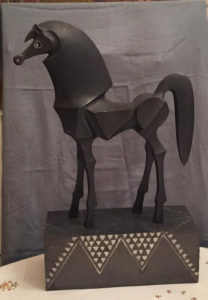 In his creations, Abdel Wahab used many different materials, such as pottery, stone, and polyester with metal. Today he is considered to be an icon of the Egyptian visual arts scene.